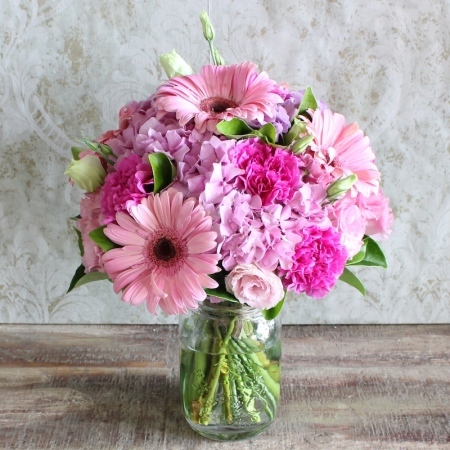 The Mason Jar has come a long way, while traditionally used for preserving Jam,Chutneys and other kitchen delights, We think the Mason Jar makes the perfect recycled vase that can be used over and over again.With a sweet mix of lisianthus,gerberas and carnations, the `Pink Jam` posy is perfect for all occasions. Another great way to reuse and recycle glassware. Order online by 2:00pm and receive same day delivery.